Investing in blue-chip dividend growth stocks such as the Dividend Aristocrats or Champions has become very popular with retirees. This is understandable considering the low interest rate environment we find ourselves in. Traditional fixed income investments do not currently offer enough yield for the retired investor to live on. Consequently, current low interest rates, coupled with the possibility of a steadily increasing level of dividend income have made dividend growth stocks a viable and even attractive alternative. When choosing the appropriate dividend growth stock, many dividend growth investors will rightfully focus on the company’s dividend record and dividend growth more than they will its price history. However, this can be a detrimental practice if the investor ignores valuation. Unfortunately, this is not an uncommon practice. There are many dividend growth investors who will invest in a blue-chip Dividend Aristocrat even when it is overvalued at the time. Many of these investors argue that since the dividend is what is of paramount importance, being out of a blue-chip will cause them to generate less dividend income. To these investors, a dividend missed is a dividend lost. Ironically, that can be a fallacious argument because being willing to only invest at fair value can actually produce more dividend income over the long run, not less. Later I will provide real-life examples of how this works. Nevertheless, the primary thesis behind this article is to review the power, protection and benefit of focusing on valuation before you invest your hard earned money. There is truth behind the idea that the calculation of fair value is somewhat subjective, and/or not a perfect science. On the other hand, there are important principles underpinning the calculation of valuation that are valid and definable. The subjective part rests in the reality that an important component of the calculation of fair value is future based. Stated differently, assessing the fair valuation of a stock is comprised of and calculated based on past, present and future operating results. The past and present parts are relatively easy to ascertain, it’s the future part that is tricky. Nevertheless, fair valuation can, and I submit should be a major consideration regarding the purchase of a common stock - dividend paying or not. Therefore, I would like to share some thoughts that Ben Graham, the father of value investing, offered on the subject of the intrinsic value of a common stock. “This does not mean that all common stocks with the same average earnings should have the same value. The common-stock investor (ie the conservative buyer) will properly accord a more liberal valuation to those which have current earnings above the average, or which may reasonably be considered to possess better than average prospects. But it is of the essence of our viewpoint that some moderate upper limit must in every case be placed on the multiplier in order to stay within the bounds of conservative valuation. Note in the quote above that Ben Graham suggested a P/E ratio of 16 as the upper limit of what a prudent investor should rationally pay for a stock. However, he did suggest that a more liberal approach could be made if the growth rate was high enough. But even then, he considered a P/E ratio of 16 as an upper limit. Although it may be confusing, or difficult to wrap your mind around the idea, that both a 5% grower and a 10% grower will utilize the same price earnings ratio to identify intrinsic value, there is a logical explanation. Buying a company at a sound valuation does not determine the rate of return you can earn. Instead, it means that you are making a sound purchase based on a rationally expected valuation that the marketplace will apply to a legitimate operating enterprise (a company or stock). The rate of return that an investor should logically expect to receive will be more a function of the rate of change of earnings growth that a given company is capable of generating. The faster the earnings growth rate, the higher your return expectations should be. I intend to demonstrate that when you invest at intrinsic value levels, your long-term rate of return will inevitably be a function of your company’s earnings growth. Stated more directly, if you buy a 5% grower at intrinsic value, your long-term capital appreciation expectation should be 5%. If the company pays a dividend, you can add that to your total return. In contrast, if you buy a 10% grower at intrinsic value, your long-term capital appreciation expectation should be 10%, plus dividends as above. This last statement is predicated on what I consider to be the reality that common stocks will inevitably be priced at fair valuation levels in the long run. Over the short run, price and value can become disconnected, sometimes significantly, and sometimes over an extended period of time. Nevertheless, inevitably, markets will become rational and fair valuation will manifest. The point is that intrinsic value will inevitably manifest over time. Therefore, if you adhere to investing under the principles of intrinsic value, you will be making sound and intelligent decisions that provide a margin of safety and compensate you for the risk you take. However, your investment receives its value from the cash flow it produces. The higher the growth rate, the more cash flows the company will produce, and the higher the rate of return that can be expected as a result. But perhaps most fundamentally, the reason the same P/E ratio applies to various growth rates has to do with minimum values based on yield. With common stocks it’s earnings yield, however, with bonds there's a related interest yield. There are sound business and economic principles behind the concept of valuation. Ben Graham did more than give us a formula for calculating intrinsic value, he taught us that valuation matters a lot. When you pay more than sound valuation indicates, you will be taking more risk for potentially a much lower return than you deserve. Conversely, if you buy at a bargain price, your risk will be lower and your future returns potentially higher. But perhaps most pertinent to this article, if you come across a blue-chip dividend growth stock that you really like but is simultaneously overvalued, I am suggesting that it will pay you to wait for fair value before you invest. But the part that is perhaps most misunderstood is that not only will your long-term total return be higher, but if you’re patient enough to wait for fair value, your long-term dividend income will be higher as well. Many people believe that the sooner you invest in a blue-chip like a Dividend Aristocrat, the more dividend income you will receive. They believe that time in produces more dividends, but I suggest that they are wrong to think that. Being only willing to invest at fair value will produce more dividends in the long run, as I will demonstrate later. “7.Price no more than fifteen times average earnings of the past three years." (This figure corresponds to 15 times earnings and 1 1⁄2 times book value. It would admit an issue selling at only 9 times earnings and 2.5 times asset value, etc.)" The suggested maximum figure of 15 times earnings might well result in a typical portfolio with an average multiplier of, say, 12 to 13 times." Clearly, Ben Graham had a strong focus and opinion regarding a P/E ratio of 15 as an important valuation metric. Frankly, I support the concept of the P/E 15 representing fair valuation, or whatever you want to call it, for the majority of publicly-traded companies. Furthermore, I would like to add some additional color and clarity on how and why I believe a P/E of 15 is so important and relevant to valuation considerations on common stocks. Additionally, a P/E ratio of 15 represents a valuation metric of a current earnings yield that also closely correlates with the long-term rate of return (6% to 8%) that stocks have delivered when valuations were aligned with intrinsic value (P/E 15). Without further elaboration, my contention is that a 6% to 8% return is a rational expectation of what a typical or average company can be expected to generate over the long run. Admittedly, a P/E ratio of 15 does not apply to all stocks, but research, observation and long experience have convinced me of the relevance and importance of the P/E ratio of 15 as a valuation guide. Nevertheless, and as I indicated earlier, the proof is in the pudding. In other words, theories may be great, but can they be applied and tested in real-world circumstances and conditions? My answer is emphatically yes, and it is based on decades of observation and validation on thousands of stocks utilizing the F.A.S.T. Graphs™ research tool. However, the real point is that waiting for fair value will produce more dividend income in the long run, generate more capital appreciation and simultaneously reduce risk. In the following examples I’m going to utilize the performance calculating functionality of F.A.S.T. Graphs™ to illustrate my thesis. I’m going to assume a $10,000 investment in each of my examples where the first pop-up will calculate the number of shares purchased and the P/E ratio at the time of purchase. The second pop up will include the capital appreciation (growth) and the total amount of dividends earned. I am asking that the reader focus on the dividends primarily in order for me to illustrate that waiting for fair value can produce more total dividend income in the long run. With my initial example I’m going to run some long-term rate of return calculations to include total dividends paid on the utility stock Consolidated Edison (ED). 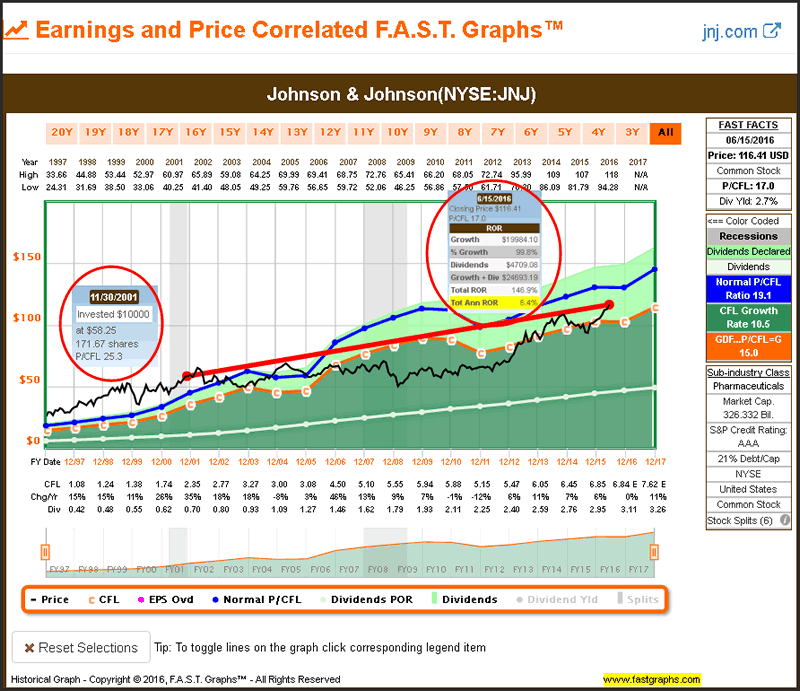 With low growth utility stocks, fair valuation becomes an even more important consideration. On the following F.A.S.T. 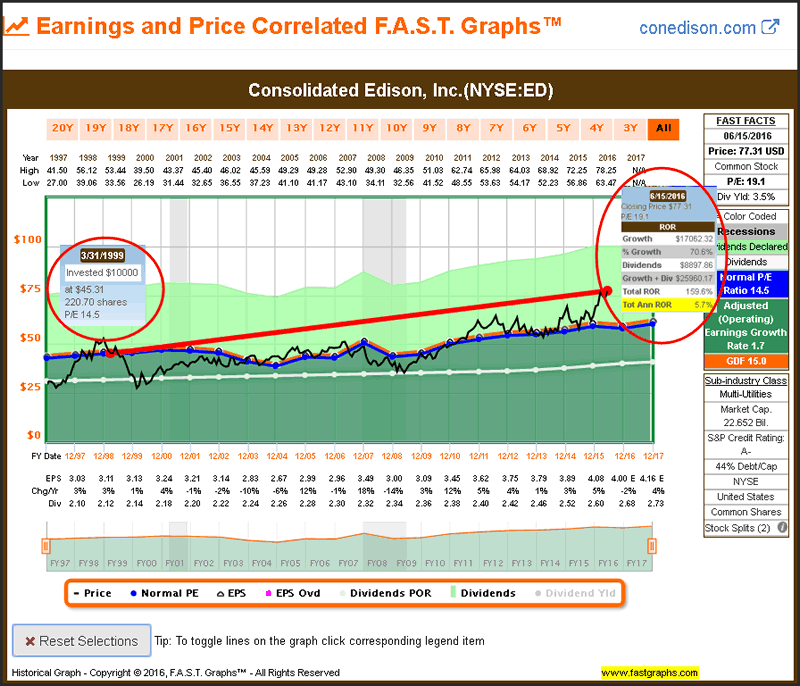 Graphs™ I am assuming an investment in Consolidated Edison on December 31, 1998 at a P/E ratio of 17. Note that this is above the upper limit P/E ratio of 16 that Ben Graham suggested. As I indicated earlier, paying more than fair value does not necessarily mean that you won’t make money in the long run. However, it does suggest that you will make less than you should - and do so at a higher level of risk. But as I will demonstrate with my next calculation on Consolidated Edison, it will also result in generating less cumulative dividend income. With low growth utility stocks, it pays to wait for fair value to manifest. If you invested $10,000 in Consolidated Edison on December 31, 1998 at a P/E ratio of 17, your total annualized return through yesterday’s closing stock price would be 4.7%. That is a positive number, and it is in excess of the company’s earnings growth achievement primarily as a result of the company currently being overvalued once again. But take special note of the amount of total dividends of $7723.93 received over this timeframe. With this next illustration, I assume that we patiently wait for Consolidated Edison’s price to move back to fair value. 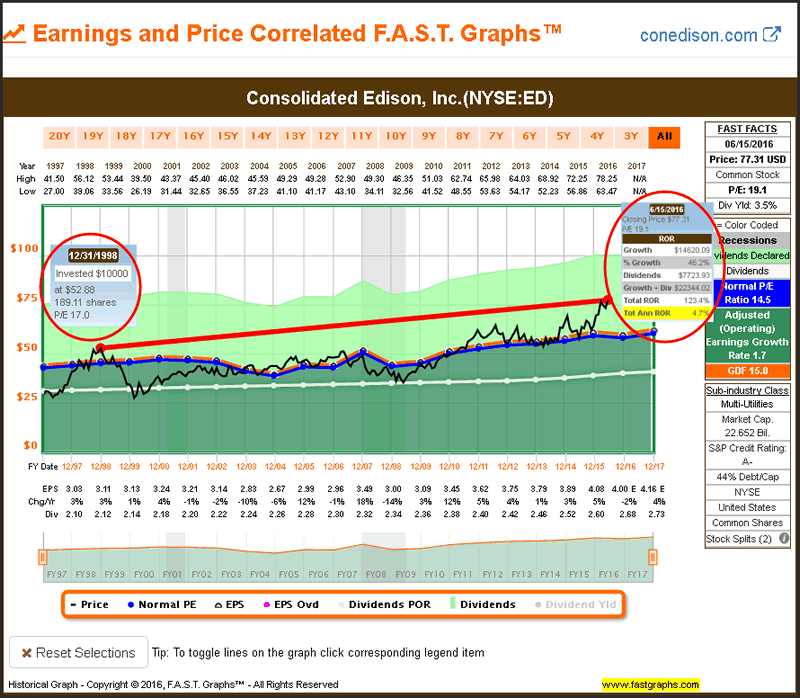 In this instance, we didn’t have to wait very long as Consolidated Edison’s price moved to a fair value P/E ratio of 14.5 (below our fair value 15 P/E ratio) on March 31, 1999. Therefore, we only had to wait 3 months for fair value to manifest and essentially would have only had to give up approximately one quarter’s worth of dividends. From a capital appreciation perspective, we only picked up approximately one percentage point of annual capital appreciation (5.7% annualized versus 4.7% annualized). However, even though we missed a quarter’s worth of dividends, because we were able to purchase more shares at the lower valuation, we received $1173.93 more dividend income ($8897.86 versus $7723.93 of dividends). Waiting for fair valuation generated more dividend income - not less. 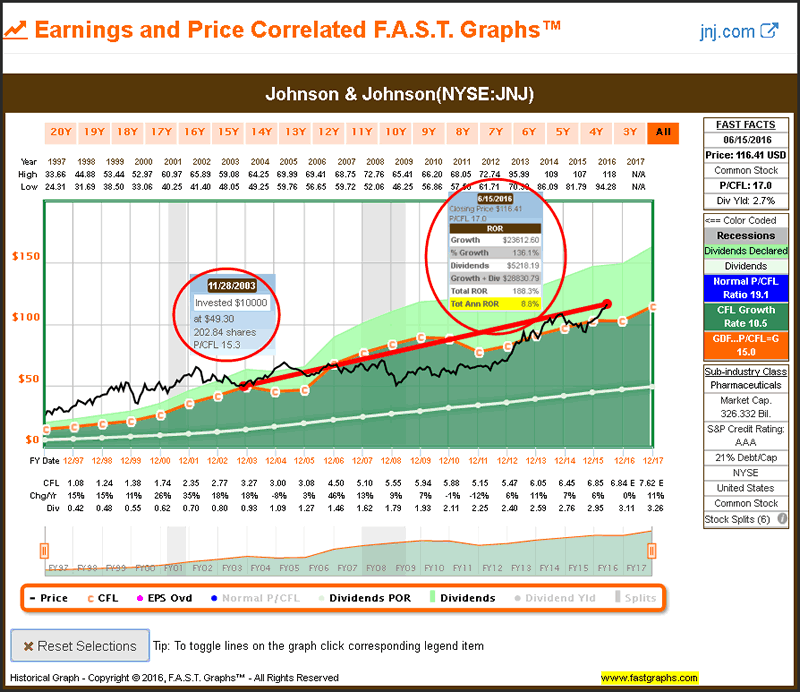 With my next example I’m going to look at what many might consider the king of all dividend growth stocks - Johnson & Johnson (JNJ). However, with this faster-growing example, I’m going to run an illustration where I wait a full two years for fair valuation the manifest. To be clear, I am forgoing two complete years of dividend payments while waiting for fair value to manifest. In this example I’m going to utilize operating cash flows instead of earnings. My hypothetical initial $10,000 purchase will be made on November 30, 2001 when Johnson & Johnson was trading at a price to cash flow of 25. Now, even though I would be significantly overpaying for Johnson & Johnson at that time, over the long run (through yesterday’s close) I would have earned a total annual rate of return of 6.4%. I did not lose money, I would have received $4709.08 worth of dividends and my initial investment almost doubled. At this point, it supports the argument that you can invest in a blue-chip even when valuation is high and still do well. With my next calculation on Johnson & Johnson, I assume that I patiently wait for fair valuation to manifest. With this company, I had to wait a full two years before I can buy Johnson & Johnson at a fair value threshold on November 28, 2003 when its price to cash flow was only 15.3. Here is where the importance of fair valuation gets interesting. Although I gave up two years’ worth of dividend payments, my total dividend income of $5218.19 is significantly higher than the $4709.09 of dividends I would have received by investing two years earlier. What’s even more interesting, is that my $10,000 from a capital appreciation perspective would have grown to $23,612.60. To summarize, I held this investment for two years less time, I received more dividend income and more capital appreciation that led to a total annualized rate of return of 8.8% versus the 6.4% annual rate of return I would have received by investing two years earlier. When investing for the long run, valuation matters - and it matters a lot. Importantly, not only did I receive more dividends and a higher rate of return, I also took less risk to accomplish it. With my final example I’m going to illustrate the power of waiting for fair valuation even when investing in a high growth stock like Starbucks (SBUX). Additionally, this gives me the opportunity to clarify something about overvaluation or high valuation. Investing when valuations are too high does not necessarily mean that you will lose money by doing so. This is a common misconception that many investors hold. If the company is growing fast enough, you can pay too much and still generate an acceptable or even above-average return. My first example with Starbucks represents a case in point. You could have purchased Starbucks at a P/E ratio of 55 on November 30, 2004, and if you held on, you would have averaged a total annualized rate of return of 13.1%. This number is significantly better than most companies are capable of achieving. However, you are clearly taking on a lot of risk and your return over the next three or four years would have been dismal. Consequently, the odds are pretty high that most investors would have sold this holding prior to the recovery that occurred longer-term. With my Starbucks’ example, it took approximately three years before this powerful growth stock came down to fair value. However, the results achieved are quite interesting on a couple of counts. Not only did waiting for fair valuation produce significantly more capital appreciation, it also produced more dividend income. I find this interesting because Starbucks did not start paying a dividend until 2010. Nevertheless, the disciplined value investor actually received more dividend income because they purchased more shares at the better valuation. The next reason I find this interesting is because the valuation standard for a high-growth stock like Starbucks is somewhat different than a low or average grower like we saw previously. 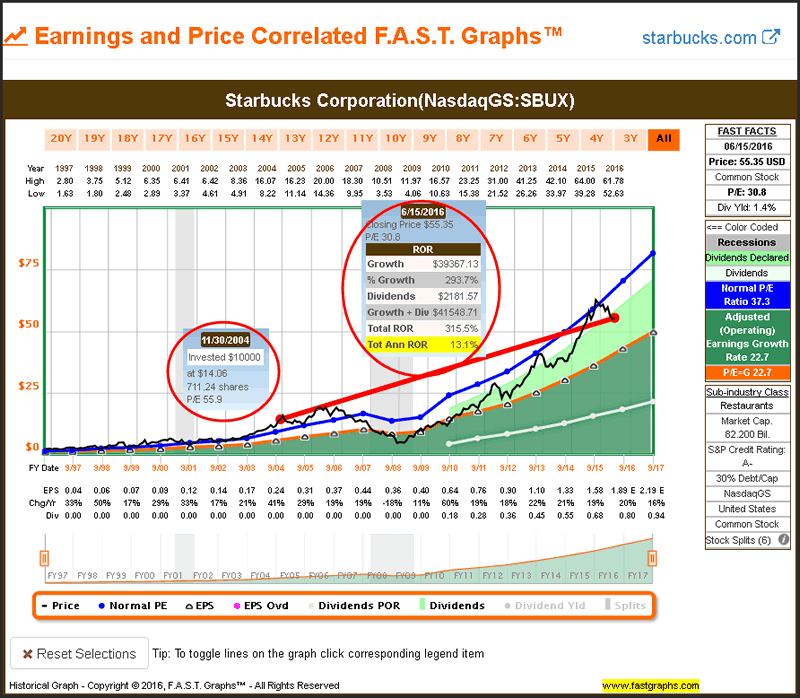 In the case of Starbucks, the fair valuation formula utilized was P/E ratio equal to earnings growth rate. In this example, a P/E ratio of 22 represented sound valuation even though it was above the Ben Graham recommended P/E ratio of 15 to 16 threshold range. 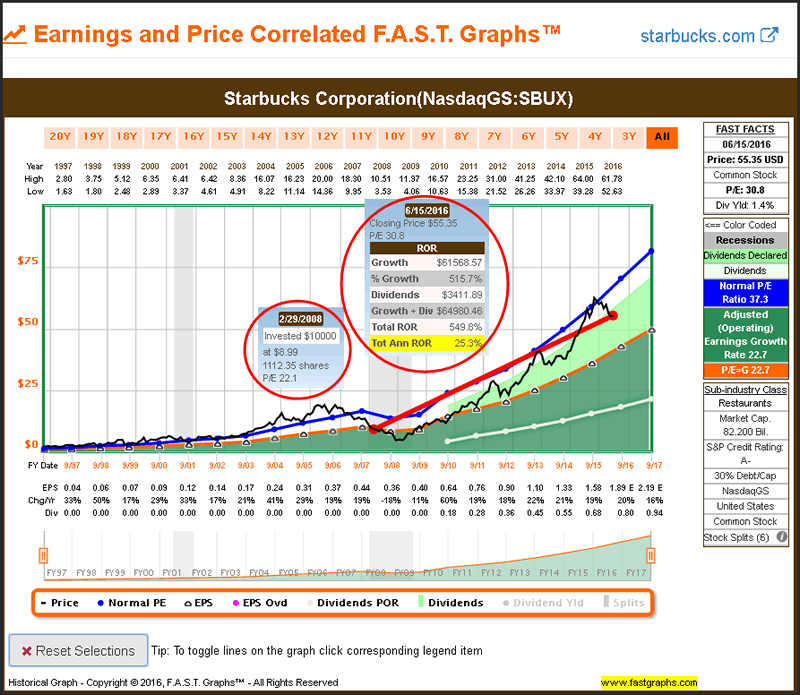 The power of compounding at a high-growth rate is what affords Starbucks a higher valuation. Having the discipline to invest only when sound valuation is evident is both powerful and protective. In each of the examples above, the effect of investing at sound valuation empowers the investor to purchase a greater number of shares. Consequently, you are effectively buying more earnings with the same amount of money than you would at a higher valuation. However, it’s important not to mistakenly believe this simply occurs because you are investing at a lower price. It is not the lower price that produces the advantage; it is the lower multiple of earnings that you are paying. To understand this better, recognize that with each of the examples above the hypothetical investor was purchasing the stocks within a reasonable range of similar earnings. In other words, the benefit came from the lower P/E. The lower price is simply a side effect. Furthermore, it’s also important to focus on the reason why better valuation produced more cumulative dividend income over the longer run. When you are investing at sound valuation, you are purchasing more shares than you would be at a higher valuation. In essence, this provides greater leverage enabling the investor to produce more dividend income and a higher level of capital appreciation. But perhaps best of all, these enhanced returns are produced at a lower level of risk. Generating better returns with less risk is the Holy Grail of investing. In closing, I wanted to be clear that I’m not suggesting sitting on the sidelines waiting for valuation to manifest. I believe it is a market of stocks - not a stock market. And consistent with that belief is the reality that there will always be overvalued, fairly valued and even undervalued individual stocks available in every market. Therefore, what I am suggesting is having the discipline to only invest when sound valuation is manifest. No matter how much you like the company, I believe it is never prudent to pay too much. If the company you like is trading at too high a valuation, then look for another company with similar characteristics that can meet your goals and objectives that is fairly priced. When the day comes when valuation is sound, and my experience tells me that it inevitably will, then and only then should you invest in the company you admire. Being a value investor is more about discipline than it is about intelligence. © 2016 Copyright Charles (Chuck) C. Carnevale - All Rights Reserved Disclaimer: The above is a matter of opinion provided for general information purposes only and is not intended as investment advice. Information and analysis above are derived from sources and utilising methods believed to be reliable, but we cannot accept responsibility for any losses you may incur as a result of this analysis. Individuals should consult with their personal financial advisors.